MEMORIAL DAY WEEKEND | MAY 24-26, 2019 IN HISTORIC DOWNTOWN OPELIKA, AL. The Sound Wall presents an evening with Leon Majcen & Bryan Elijah Smith on June 26, 2019, at 7 PM. Come and enjoy some great music from two talented songwriters. There are only fifty tickets available, so invite your friends! Click “Buy Tickets” below for more information. 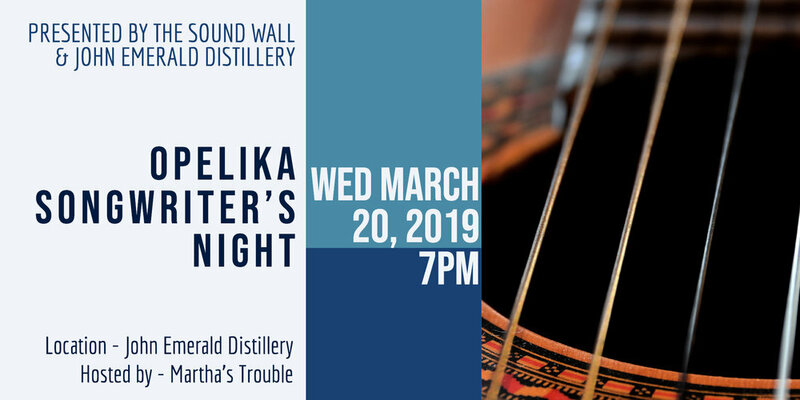 Opelika Songwriters Night featuring local and regional songwriters 'in the round' at John Emerald Distillery in Downtown Opelika. Come enjoy fine original songs performed by the writers themselves in an intimate listening environment. Show starts at 7pm. No cover. (3) Songwriter's per round, performing (3) original songs. Songwriters interested in performing, please complete form below. The Sound Wall will host an evening with Matt Prater on March 22, 2019, at 7 PM. This evening features live music with a singer-songwriter that has played with some of the best country and folk names in the industry. Come enjoy a night of music in an intimate listening environment. The show starts at 7 PM. 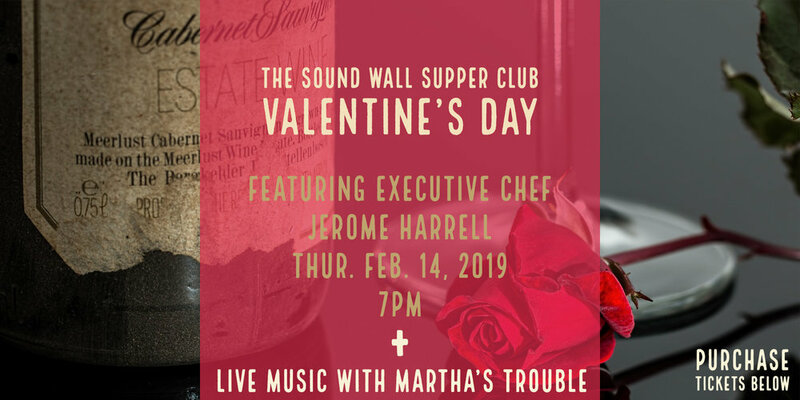 Come celebrate Valentine's Day with your valentine at The Sound Wall. We are excited to have Executive Chef, Jerome Harrell offer a special menu for this occassion where you will get to choose between two menu options. To make it even more special, we will have live acoustic music by Martha’s Trouble before and after dinner. Valentine's Day with Executive Chef, Jerome Harrell. Live acoustic music for your pre-dinner cocktails and again for your after dinner drinks! Kendrick Bro's Movie Cast/Crew "Overcomer"
and serving countless non-profit organizations. 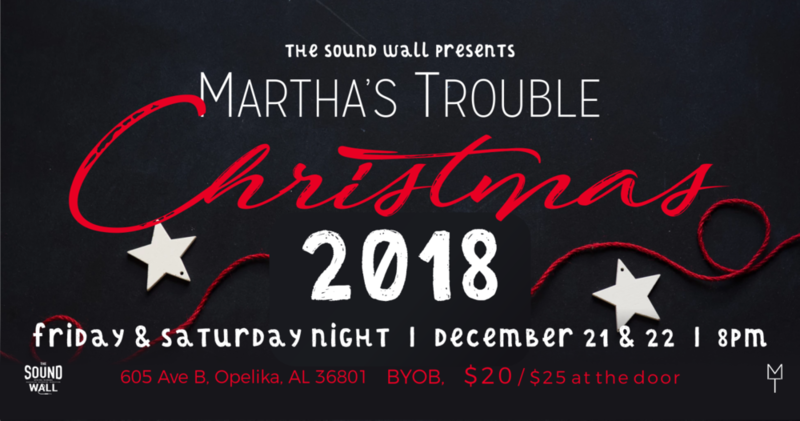 Join Martha's Trouble for an acoustic Christmas at their home studio, The Sound Wall located in Historic Opelika, Alabama. Martha's Trouble Christmas Shows are a fan favorite. These shows are mixed with your favorite Christmas songs, MT songs, and stories. A great way to enjoy the Christmas Season with friends. *This concert always sells out, so hurry and get your tickets today! *Please bring your own beverage of choice. Water & Coffee will be provided. The Sound Wall Supper Club is truly a one of a kind culinary experience. You will join the chef in the Sound Wall’s gourmet kitchen, smell the wonderful aroma’s as they cook a 3 or 4 course meal right before your eyes. You will hear the inspiration behind each dish, what inspired the menu, and how each course was prepared. Seating is limited and is open to the public making this a true community experience at it’s core. Take a break from the norm and come experience the next Sound Wall Supper Club! Singer-songwriter Kate Kelly uses her authentic lyrics and melodies as a vehicle for her expression of the human experience. Inspired by the emotional and honest writing of solo female artists such as Norah Jones, Feist, Laura Marling and Joni Mitchell—Kate’s music takes listeners on a familiar yet uncharted journey, weaving her narrative through jazz, blues and folk styles. In May 2016, Kate released her debut EP, New Heartbeat. This first effort is a culmination of Kate’s musical journey, capturing imagery inspired by her roots on the Gulf Coast as well as her present home in Nashville. 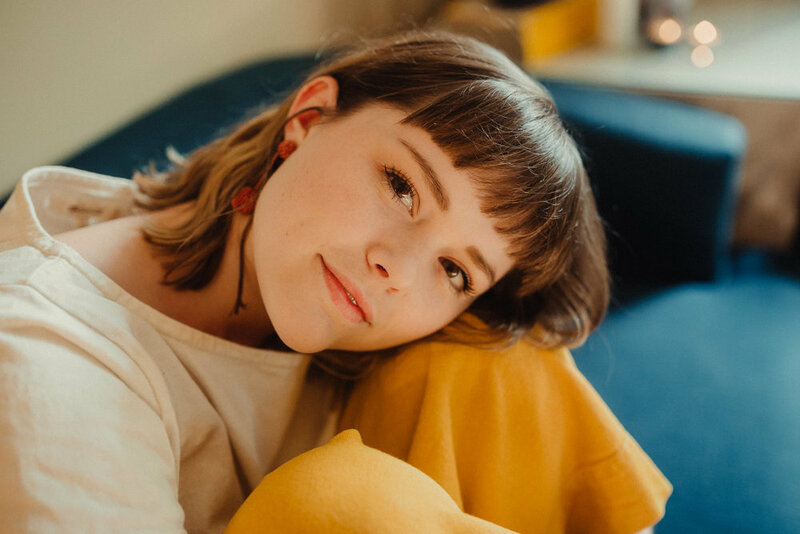 On top of an increasingly diverse array of both solo and full-band promotional shows, Kate has been working diligently to refine her artistic voice and to grow her musical repertoire in anticipation of a sophomore studio release. The Wonder Of It All LP will be available in fall 2018. Join Opelika native Sylvia Rose Novak and her band to celebrate the release of “Someone Else’s War”. Adkins' sound is deeply rooted in the folk traditions of the South, deftly blending thoughtful lyrics with an accomplished fingerpicking style. Based in Nashville, TN Jacob Blount has roots across the South, with an accompanying quirky rock sound that characterizes his love for pop and blues. **Seating is limited to 55 seats - get your tickets early. Join us Saturday July 14 as The Sound Wall Presents Ted McVay in concert in the live room. This is a live show & video shoot. The Sound Wall will have a film crew taking video of Ted's performance. Come be a part of the live audience and support Ted in this live film project. An evening with Rock Killough & Rick Carter at The Sound Wall 605 Avenue B in Opelika , Alabama. *Note this event is BYOB. The Sound Wall presents an evening with Leon Majcen + special guest Stuart Scott Bell. Leon Majcen is an emerging folk-rock singer/songwriter based in Tampa Bay, FL whose distinctive vocal tone, dynamic guitar playing, and a lyrical depth beyond his years is gaining quick traction in the Folk/Americana scene. With diverse influences that span folk, blues, and country and artists such as Bob Dylan, Tom Waits, and Johnny Cash, his old-soul approach to songwriting delivers fresh appeal with an energetic twist to fans of those classic genres. His first single “Love and Misery”, alongside a handful of other tracks remain in rotation on Sirius XM The Coffeehouse, and listeners across the globe are responding, streaming his music on Spotify at a rapid rate. His Love & Misery EP, released in 2017, will be followed up in 2018 with the release of his album, Trace of Red, in full, this summer following his mini-tour across the US. Songwriters interested in performing, please email info@thesoundwallopelika.com. 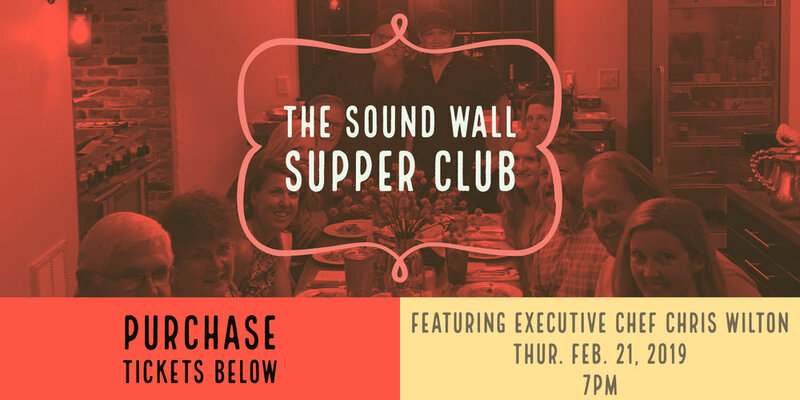 The Sound Wall Supper Club is a monthly gathering to experience new and exciting cuisine prepared by a Professional Chef. Only 10 seats at the chef's table! So get your friends together and reserve the table OR come and meet someone new! The Supper Club is for those who enjoy going out for dinner and trying something new. Come as strangers and leave as friends! (3) Songwiter's per round, performing (3) origianl songs. Come celebrate the release of Ted McVay's debut album, Voices in My Head. The ticket price includes hors d’oeuvres by Chef Chris Wilton, beverages, a copy of the CD, and a concert. Limited seating, don't wait to purchase! Join Martha's Trouble for an intimate, relaxing evening of Christmas music in their newly renovated studio, The Sound Wall! Seating is limited so be sure to get your tickets early. Dessert included with ticket price, please bring your preferred beverage of choice. This month, we welcome Sous Chef Adam Beckel from The Depot Restaurant in Auburn, Alabama. Celebrate the launch of Wild Fire Records on December 9th at The Sound Wall. Come hear live music from label artists Isaac McCarty and Jennifer Whitmore. Limited tickets available. $20 in advance/$30 at the door. Ticket includes food, music, and a gift to take home. (ticket price does not include food). "Opelika native Singer-Songwriter Sylvia Rose Novak performs unreleased tracks from her upcoming third studio album, as well as fan favorites from previous releases in a listening room environment. Novak will be joined by her band for an extensive set of fiddle-driven, Southern Gothic-inspired rock n' roll with a West Texas flair." A night out on the town! Dinner & Show! 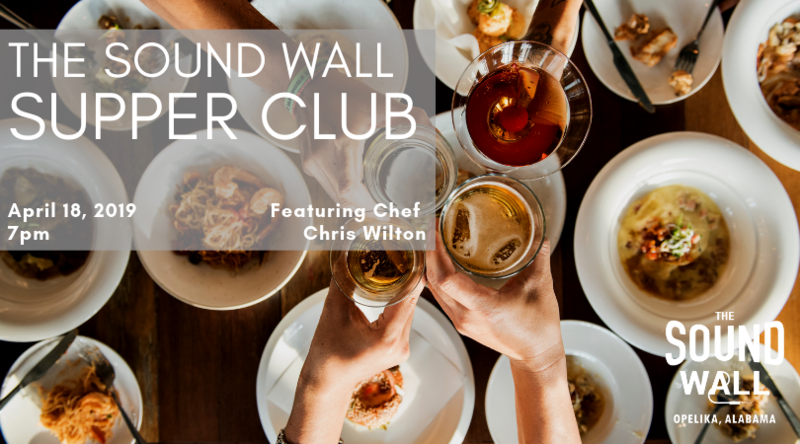 On Thursday October 26 join us for dinner at The Sound Wall in Downtown Opelika for a delicious menu prepared exclusively for you by Chef Chris Wilton. Dinner will conclude by 7pm, allowing you ample time to head to the Opelika Center For The Performing Arts to enjoy the Vienna Boys Choir presented by East Alabama Arts! Braised Short Ribs w/hominy stew and sorghum collards. Chocolate Mousse Cake w/creme anglaise and raspberry sauce. NOTE: please feel free to bring your own bottle of wine or beer and after dinner drinks.